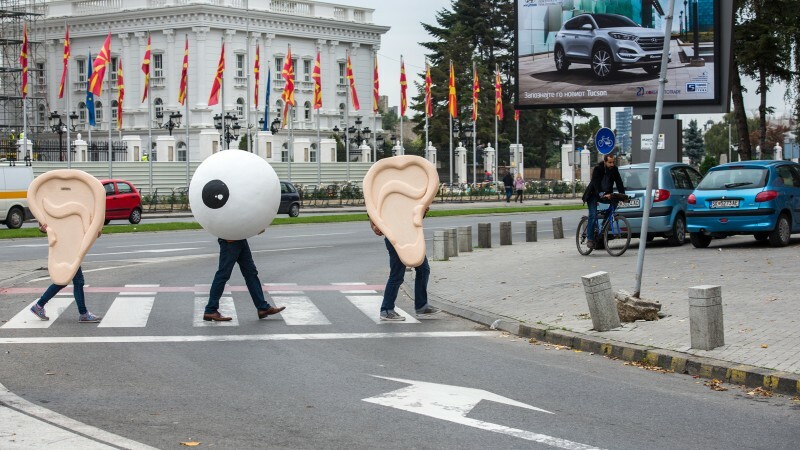 Three activists from Metamorphosis Foundation cross the street to the Macedonian government building in Skopje, wearing eyeball and ears costumes to symbolize the illegal surveillance that civic society organizations and journalists have been subjected to. Photo by Vanco Džambaski, used with permission. A human-sized eyeball sandwiched between two giant ears cross the street before a government building in Skopje, Macedonia. 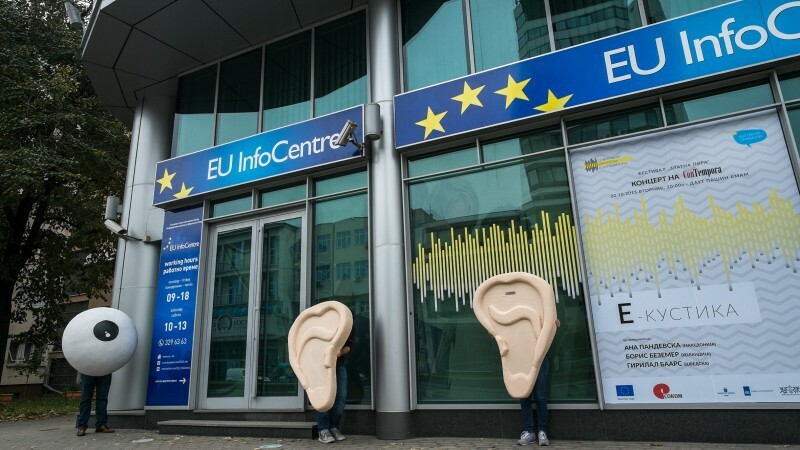 The trio performed a larger-than-life act of eavesdropping to protest mass state surveillance of journalists and civic groups, an activity that leaked recordings of illegal wiretaps have proven the Macedonian government has been engaged in for years. Behind the eye and ears (and the distinct reference to the Beatles’ Abbey Road album cover) were activists from the digital rights non-profit Metamorphosis Foundation and the informal coalition Citizen for Macedonia, who staged the demonstration to honor Freedom Not Fear, an EU-based campaign against mass state surveillance. 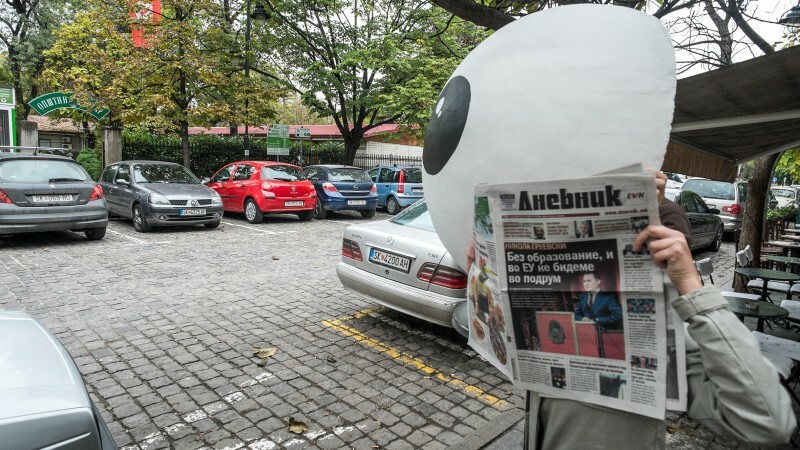 The big eye pretending to read a newspaper while spying on the municipality of Centar and the mayor, Andrej Zernovski. Photo by Vanco Dzambaski, used with permission. A massive trove of audio files and archives (known locally as “bombshells”) released by opposition leader Zoran Zaev almost one year ago revealed that the communications of more than 20,000 individuals in Macedonia had been secretly recorded illegally, including more than a 100 journalists and civil society activists. The big eye and ears took a stroll on 16 October from the government and the headquarters of the ruling VMRO-DPMNE party to the Helsinki Committee for Human Rights, the municipality of Centar, the European Union delegation's building, the weekly magazine Fokus and the Metamorphosis Foundation, where the Meta news agency and Portalb news portal are situated. The big eye and ears in front of the EU delegation's building in Skopje. Photo by Vanco Dzambaski, used with permission. Zoran Zaev's party claims to have obtained these records from whistleblowers within the Ministry of Interior and has since used them to expose the wrongdoing of the ruling party and, most likely, to draw more supporters into their own ranks. These corrupt behaviors were not news to anyone in Macedonia, but the hard evidence was welcomed by rights advocates who have worked for years to improve transparency and increase public accountability for spending and policymaking by the ruling government. Along with the activists’ public demonstration, on 19 October Metamorphosis hosted a debate on the safety of communications and threats from monitoring and surveillance of communications. There are standards according to which communications can be monitored and personal data can be collected, and every violation [of these standards] is actually a violation of privacy. Telecom operators and [Internet service providers] should have mechanisms for guaranteeing their user’s privacy, and providing safety and confidentiality of their data and communications. They need to take technical measures to secure the data, and destroy the data if the purpose for their collection has been fulfilled. Recent reforms require telecommunications operators to build “back doors” into their technologies so that the Security and Counterintelligence Service, known as UBK, can listen to the conversations of just about anyone it chooses. Although the Constitution requires that the UBK obtain a court order before doing so, the new policy and practice disregards this requirement altogether. It seems that the telecom operators have been compliant in this illegal surveillance scheme all along. According to Volcheska, telecom operators in Macedonia collect and store all telephone metadata for 12 months. European Union regulations would prohibit such a lengthy storage period, an important detail as Macedonia is currently seeking accession to the EU. Volcheska also confirmed that the directorate has not initiated proceedings on behalf of citizens affected by what the wiretaps revealed, and explained that this is because none of the individuals who were wiretapped had submitted a complaints about their cases thus far. This is not surprising, given rapidly declining levels of citizens’ trust in their government. 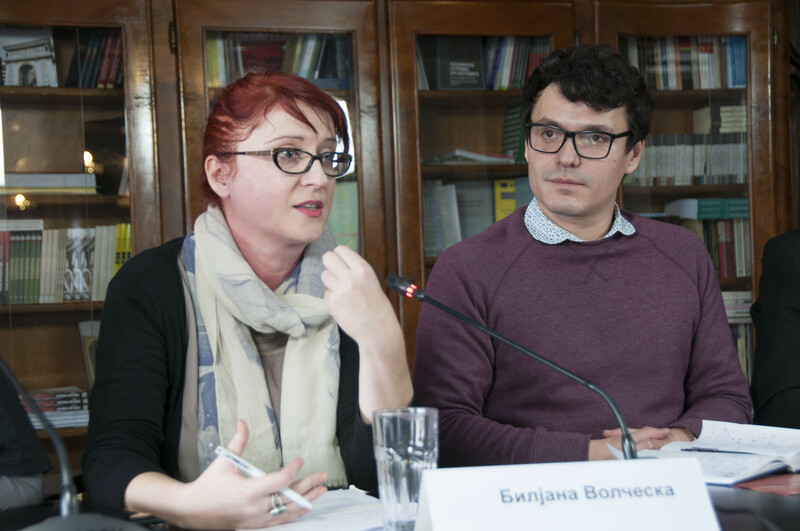 Violeta Gjorgjievska from Internet Hotline Provider – Macedonia, a local civil society organization that works on the protection of digital rights, spoke on instances of online harassment in which wiretap recordings have been used to embarrass or shame political elites. She also commented on a proposed law on “bombshells”, which if approved by Parliament, would prohibit the publication or storage of the content of the wiretapped recordings in the country and abroad. The law on the ‘bombs’, proposed by the government, is an attack on the freedom on the Internet and censors it. Such a law cannot be adopted without forming relevant bodies to prevent censorship on the Internet. This proposed law was withdrawn from the Parliament after a fierce public reaction by journalists and civil society claiming that this would mean that Macedonia officially legalizes censorship. It is now being re-negotiated by the government and the opposition. The day concluded with a workshop on the secure use of mobile phones led by Predrag Tasevski, founder of cybersecurity.mk. The Freedom Not Fear – International Action Days initiative has been present in Macedonia since 2008.